Fireworks are traditional on American Independence Day, July 4, and so when my sister was unable to see first life fireworks yesterday, I bought her a set of Henry deCuir’s Second Life® fireworks and we spent the evening on her waterfront land in the Second Life mainland with a friend watching fireworks. The fireworks were beautiful and were a vivid reminder to both of us just how much Second Life has improved visually in the six years since I first joined. 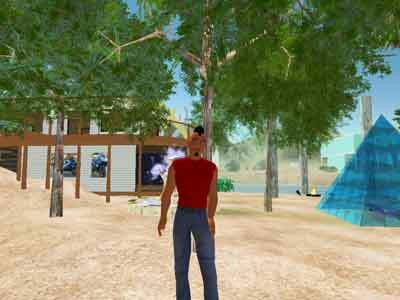 This picture shows me (as my Hawk Lightcloud avatar) in May 2004, when I was still a landless vagrant in this new virtual world, before I took advantage of the Land for the Landless program that Linden Lab used to offer and became the proud owner of a 512sqm parcel in Benten. Second Life wasn’t a very interesting place in those days, with only about 4,000 members and graphics that we’d laugh at today. Clothes were basic, avatars were basic, and landscaping was basic. I had come from the virtual world There.com, a world where I had good friends and that I loved. There.com had a beautiful range of content and smooth operating vehicles (I was freestyle hoverboard champion) that Second Life just could not match. But one of my friends in There.com, Swen_Wu_Kong, had migrated to Second Life a few months earlier as Lumiere Noir, the founder of the magnificent Ivory Tower of Primitives. In those days, Second Life wasn’t a very appealing world compared to There and I didn’t see what Lumiere Noir saw in it … until I got my Land for the Landless parcel and rezzed my first prim. It was one of those eureka! moments. Suddenly it all made sense. My former world was a world where creating original objects meant paying license fees, buying and learning expensive software, and signing over all intellectual property rights to the company that owned the world. That first day of rezzing prims opened my eyes to a whole new way of doing things. I had been skeptical in Second Life’s beta days about Philip Rosedale’s vision of a world of user-created content. I just didn’t think it would work, and the starkness of Second Life compared with the rich beauty of There.com seemed proof. But the moment I began rezzing prims, modifying them, linking them, creating objects, all without any previous skills, without buying software or paying license fees, and with Linden Lab granting me all intellectual property rights to what I created, I suddenly understood the brilliance of Rosedale’s vision. I still loved There.com, and I missed my friends there, but the combination of easy-to-use building tools and intellectual property ownership rights convinced me immediately that Second Life was the right place for me. It’s significant that a few months ago There.com went out of business while Second Life thrives. I doubt whether we’d see the intense creativity or the involvement of major businesses in Second Life without those two things that convinced me six years ago that Second Life was the right place for me.